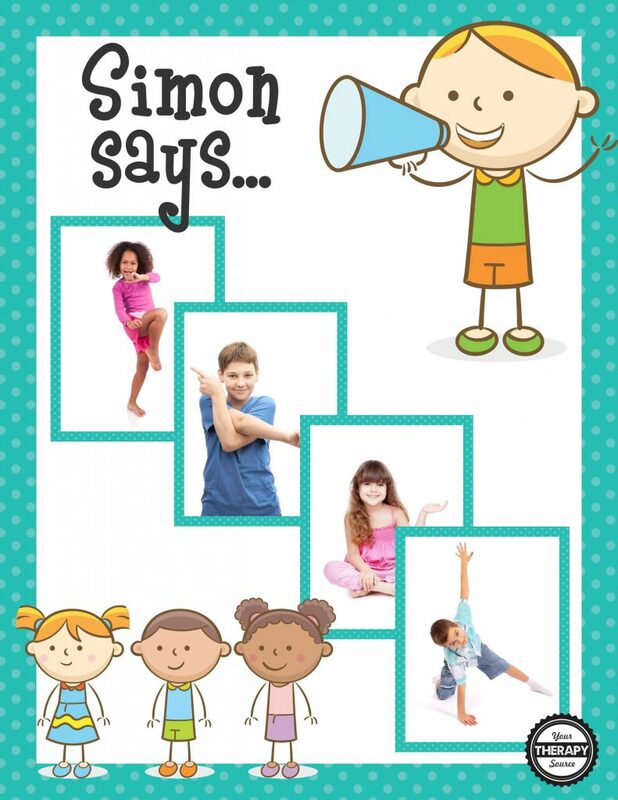 Here is a fun, new freebie from the latest download, Simon Says. Print off these 9 cards to play a quick game of Simon Says. Can the children copy the body poses exactly? These are 9 samples cards from the HUGE collection of body position cards from the complete Simon Says download. The complete download includes 68 full page body position cards, 13 stop cards, and 25 game ideas to use with the cards. Children will enjoy practicing motor planning skills, body awareness, following directions and bilateral coordination skills while playing this fun but challenging game. Make sure the right and left sides of the body match the pose correctly as well. It is not as easy as it looks! The best thing about the Simon Says packet is that if you want it requires NO PREP. Just download (and print if you want) the PDF document and show the children the full size body position cards to copy. As you move through the activity, the Simon Says Stop cards appear randomly and children can freeze in the position until you change it to the next card. It doesn’t get any easier than this. Simon Says is a wonderful extra activity to have available for brain breaks in the classroom, large group instruction or send home copies of the small cards with the game ideas for a home exercise program.